Giant behemoth Microsoft crushed the life out of a very creative ad for its Xbox 360, sitting on it and refusing to allow it to air. Fans, however, not only spread it around on the 'net, but actually reenacted it. Flashmobbers at the University of Florida were so taken with the ad that more than 100 of them stunned passersby by taking up their best first person shooter stance and having at it. For those who have been wondering for the last several paragraphs, a "flash mob" is a group of people who suddenly turn up at a particular location with the exact same agenda. 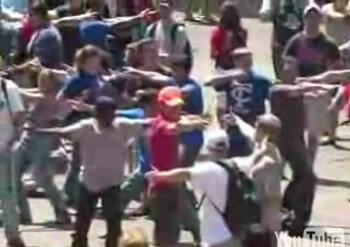 The first known flash mob appeared in Macy's department store in Manhattan. More than one hundred people converged on the rug department on the ninth floor, gathering around one particular rug. When asked by sales people, every flashmobber had the same story: they lived in a warehouse, they were shopping for a Love Rug, and they always made their purchases together. It turns out that the name "flash mob" has at least some of its roots in science fiction. In the 1973 story Flash Crowd by Larry Niven. Niven's story explored some of the social consequences of teleportation. Take a look at the banned Xbox commercial and the all-volunteer flash mob recreation of the Xbox commercial. I think I found this one on digg.